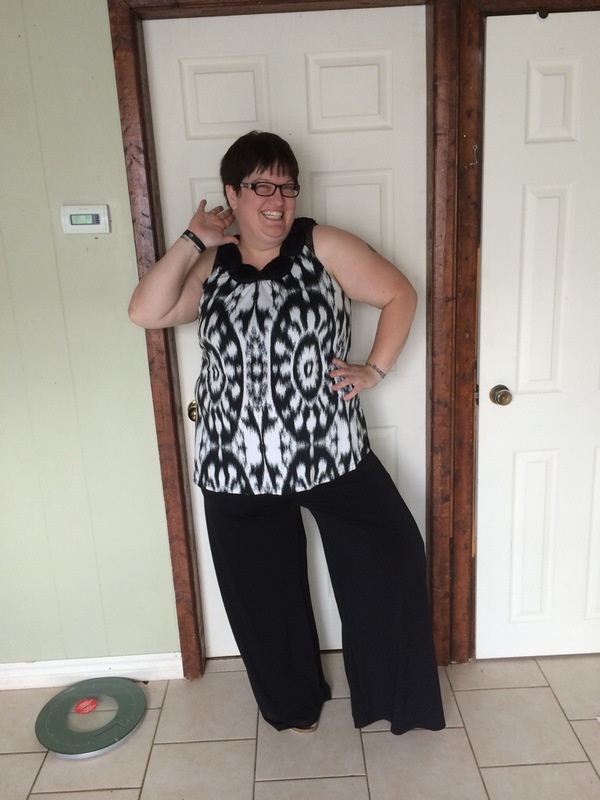 June 5th – Weight unknown, NSV to report | I want to be different, just like everybody else. I just finished dinner and it looks as though I’m able to tolerate pasta! I know why they don’t want us having it – because it’s just carbs and our bodies don’t tolerate carbs well – but I figure if I have a good protein as a main and then the pasta as a small side I should be fine to have it once in a while. Today I have an NSV (non-scale victory) to report. I needed some new pants because mine were too big. Now, I have been a little downhearted lately because the scale hasn’t been moving. I know it’s normal at this stage but it still feels crappy. Anyway, my pants are too big and so Zoey and I went to Value Village (a second hand store) to look for clothes for cheap. Well I only found 1 pair of pants that I liked and 1 shirt. BUT the NSV part is that I’m down 2 full sizes! I’ve gone from a size 24 pants and 4x shirt to a size 20 pants and 2x shirt. I’m so excited! So maybe I’m not seeing pounds coming off yet but inches are. I also got a hair cut to make me feel a little better. Yesterday we went to the grocery store and I got REALLY bummed out. I wanted something good to eat, but everything was either not good for me, not yet on my approved list, or just plain old not appetizing. So I bought strawberry Tic Tacs so I could feel like I was eating candy but not do too much damage. It worked a bit, but boy are those suckers small! Not much else to report. I haven’t taken my weight today because I’m always heavier in the evening and was in Guelph and therefore without a scale this morning. Plus I was more excited to relay my inches lost than another post about no weight being lost. I’m doing really well tolerating mushy foods. Haven’t thrown up yet but I came very close at lunch time. I was having canned turkey (don’t judge but I love that stuff!) with calorie wise mayo, mustard and relish and some Melba toast (which is all on my approved foods list). Well, about half way through I got this awful feeling like I had swallowed a lump that just got stuck at the bottom of my esophagus. I knew nothing was stuck because I was chewing everything really well but this feeling wouldn’t pass. I gave the rest of my meal to Zoey and got up. I thought I was going to be sick and stood in the doorway of the bathroom for a good 5 minutes before the feeling passed. Tonight at dinner I decided to try the toast again but this time I went slower and only had one piece… And I started to get the same feeling. So it’s definitely the toast that’s not sitting well. Oh well so far that’s the only food that has done that so I’m going to wait a week before trying it again. So that’s it for today. I’m attaching my NSV picture for you all to enjoy. I was so happy – haven’t been in clothes that small in a few years. Excellent! I’m so happy for you! Yay! You are already looking fabulous! That is a fantastic victory, not to mention the whole saving your life and escaping the evil clutches of Diabetes. You rock!